345 x 242 mm. – 280 leaves. 1 painted and 15 large white vine initials. Original Italian binding. Julius Caesar, Commentarii de bello Gallico – De bello civili – De bello Alexandrino – De bello Africano – De bello Hispaniensi. The memoirs of the campaigns in Gaul from 58-52 BC and of the civil war against Pompey in 49-48 BC are the only works of Julius Caesar to survive intact. 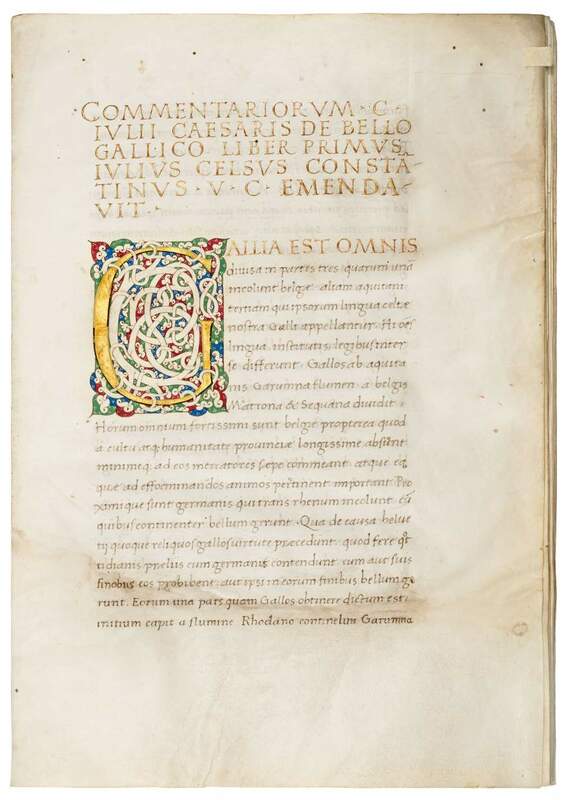 Although presented here as though they form part of Caesar’s account of the civil war, the final three works were most likely written by men who took part in his campaigns in Africa, Egypt and Spain between 48 and 45 BC: the De Bello Alexandrino is attributed to Aulus Hirtius, who also wrote Book eight of De Bello Gallico, a continuation of Caesar’s work. The decoration and script are Milanese in style as frequently found in manuscripts made for members of the Sforza court. Our initials are attributed to the illuminator known as the Ippolita Master, named after his work in manuscripts given by Francesco Sforza, Duke of Milan and his wife Bianca Maria Visconti to their daughter Ippolita in 1465. Our manuscript was owned by Giovanfrancesco Marliani, member of a prominent Milanese family, envoy of Lodovico Sforza to Emperor Maximilian.